Home / Mutual Funds & ETFs / ETF Investing / What Lies in Store for Pharma ETFs? What Lies in Store for Pharma ETFs? As we head toward the end of 2017, the pharma sector continues to perform well, representing a contrast to 2016 when the sector was under immense pressure due to the drug pricing issue. The sector was also weighed down by a significantly lower number of FDA approvals last year and was hit by some high profile R&D failures as well as mixed results, slower-than-expected new product launches and increasing competition. Pharma stocks have fared better this year with the NYSE ARCA Pharmaceutical Index gaining 16% year to date. Factors like new product sales ramp up, R&D success and innovation, strong results, a higher number of FDA approvals and continued strong performance from legacy products should help sustain the recovery. Importantly, investors are now more comfortable with the drug pricing issue and are now focusing more on the fundamentals of the sector. Tax reforms and cash repatriation are other factors that should support the sector’s performance. The year started off with expectations that M&A activity would pick up, but this did not happen. Although several small deals were announced, big-ticket M&A activity was more or less limited. Major M&A news this year in the pharma sector was Johnson & Johnson’s acquisition of Actelion for $30 billion. Apart from this, a few bolt-on deals were announced by other companies. Although several big companies remain interested in striking M&A deals, high valuations remain a major deterrent with companies remaining wary of bidding wars leading to over-priced deals. Meanwhile, in-licensing deals continue to be popular with several big companies tying up with smaller and mid-sized players with promising mid-to-late stage pipeline candidates or interesting technology. Companies developing immunotherapies are highly sought after. Several pharma companies are also streamlining operations by divesting non-core business segments and restructuring. Companies like UCB, Novartis, Teva, Sanofi, Valeant, Glaxo and AstraZeneca have all been a part of this trend. 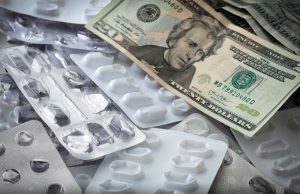 Meanwhile, Pfizer, which has already divested several of its business segments, is currently looking at strategic options for its Consumer Healthcare business. The monetization of non-core assets allows these companies to focus on their key areas of expertise. Moreover, the sale proceeds are utilized for reinvestment in the pipeline, debt repayment and for returning value to shareholders in the form of share buybacks and dividends. Restructuring activities are also gaining momentum as large companies look to cut costs and streamline operations. Most of these companies are re-evaluating their pipelines and discontinuing programs with an unfavorable risk-benefit profile. Sales of products that gained approval over the last two years, as well as line and label extensions, should ramp up and boost growth. Recent entrants like Novartis’ psoriasis treatment Cosentyx and Pfizer’s cancer treatment Ibrance have already achieved blockbuster status and are key contributors to the top line. Meanwhile, things are looking up on the regulatory front with the FDA already approving a higher number of drugs so far in 2017 compared to the whole of 2016. Moreover, with the passing of the 21st Century Cures Act, expectations are that there will be more innovation in the sector followed by a surge in new drug approvals. Pharma companies continue to work on bringing innovative new treatments to market, and there could be significant catalysts in the coming quarters in the form of important new product approvals as well as major data read-outs especially in key therapeutic areas like immuno-oncology, Alzheimer’s, central nervous system disorders, and immunology/inflammation. Key approvals this year include Novartis’s Kymriah (the first gene therapy in the United States), Lilly’s Verzenio (advanced or metastatic breast cancer), J&J’s Tremfya (moderate-to-severe plaque psoriasis), Regeneron/Sanofi’s Kevzara (rheumatoid arthritis), Roche’s multiple sclerosis treatment, Ocrevus, and Regeneron and Sanofi’s eczema treatment, Dupixent, among others. Quite a few of these drugs have blockbuster potential. While the drug pricing issue no longer remains a major headwind, it will nevertheless remain a headline risk until the administration comes out with a policy for controlling drug prices. Moreover, with increasing competition in the market and the entry of innovative treatments, pricing pressure is expected to hit sales. Another challenge being faced by the sector is the recent entry of biosimilar competition in the United States. While a relatively new area, the market for biosimilars is huge and highly lucrative with several blockbuster biologics including Humira and Lantus slated to lose patent protection by 2020. Many companies are also facing a slowdown in sales of mature products in their portfolios. At the same time, new product sales are yet to pick up significantly. Many of these companies are also facing loss of patent protection, which means generics or biosimilars, as the case may be, could enter the market soon and lead to price erosion. Highlighted below are some pharma ETFs – ETFs present a low-cost and convenient way to get a diversified exposure to the sector. Powershares Dynamic Pharmaceuticals ETF (NYSEARCA:PJP), launched in June 2005 by Invesco PowerShares, tracks the Dynamic Pharmaceuticals Intellidex Index. The fund covers healthcare stocks. The top 3 holdings include AbbVie (6.13%), Bristol-Myers Squibb Company (5.13%) and Gilead Sciences, Inc. (5.12%). The total assets of the fund as of Oct 23, 2017 were $700.2 million representing 30 holdings. The fund’s expense ratio is 0.56% while dividend yield is 0.8%. The trading volume is roughly 41,788 shares per day. SPDR S&P Pharmaceuticals ETF (NYSEARCA:XPH), launched in June 2006, tracks the S&P Pharmaceuticals Select Industry Index. This ETF primarily covers pharma stocks with the top 3 holdings being Horizon Pharma plc (5.12%), Perrigo Company plc (5.1%), and Bristol-Myers Squibb (5%). Total assets as of Oct 22, 2017 were $429.6 million representing 39 holdings. The fund’s expense ratio is 0.35% and dividend yield is 0.65%. The trading volume is roughly 66,745 shares per day. iShares Dow Jones US Pharmaceuticals Index (NYSEARCA:IHE), launched in May 2006, seeks investment results that correspond generally to the price and yield performance of the Dow Jones U.S. Select Pharmaceuticals Index. The fund mainly consists of pharma companies (90.2%). Biotech companies account for about 9.7% of the fund. The top 3 holdings of this fund are Johnson & Johnson (10.83%), Pfizer Inc. (8.7%) and Merck (7.67%). The total assets of the fund as of Oct 23, 2017 were $621.4 million representing 42 holdings. The fund’s expense ratio is 0.44% with the dividend yield being 1.31%. The trading volume is roughly 7,632 shares per day. Market Vectors Pharmaceutical ETF (NYSEARCA:PPH) was launched in December 2011 and tracks the Market Vectors U.S. Listed Pharmaceutical 25 Index. This ETF covers healthcare stocks. While the expense ratio is 0.35%, dividend yield is 1.96%. The trading volume is roughly 7,820 shares per day. The total assets of the fund as of Oct 22, 2017 were $273.6 million representing 25 holdings. The top 3 holdings of this fund are Johnson & Johnson (8.66%), Novartis (6.67%) and AbbVie (6.26%). Although pricing pressure and increasing competition will remain headwinds for pharma stocks, increased pipeline visibility and appropriate utilization of cash should increase confidence in the sector. Article printed from InvestorPlace Media, https://investorplace.com/2017/11/lies-store-pharma-etf-ggsyn/.